Question: What changes are needed for the implementation of a more sustainable (economic, social and environmental) water use model in the existing context (decision making and stakeholders framework) of Southern Mediterranean Region? 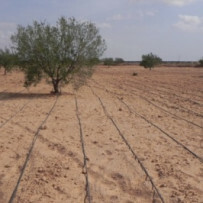 Ecological components: The current situation of the water resource use in Southern Tunisia presents “dilemmas” which are common to many areas of the Mediterranean basin characterized by drought and adverse climate conditions. Water availability is the main physical constraint: a mean annual rainfall of 160 -220 mm in some 30 days a year. Erratic dynamics of rainfall events over brief intervals often produce short and intense floods which converge into ephemeral wadis beds. Most part of the runoff water is lost, leaving scarce benefits for the local communities. Beyond climate constraints, socio-economic changes have an impact on these areas that increase competition for water use in the watersheds. Farmers communities are abandoning mountain areas to settle into plains and this results into a reduction of the available upstream water and an increase of erosion caused by an inadequate maintenance of traditional water harvesting structures. A rapidly expanding urbanization and the rapid expansion of the tourist sector generate high demand for irrigated farming that corresponds to the overexploitation and worsening of the quality of groundwater resources in downstream area. Institutions: The Tunisian water governance system is characterized by decentralized structures (public, private, research and community-based institutions) with strong influence from the central government. This system is undergoing dramatic change and new spaces for public participation in decision-making are possible. The achievement of the Tunisian long term national water strategy, based on a reduction of agricultural water demand, requires the involvement and participation of water users and their associations. In fact the interest and legitimacy of local stakeholders is generally high but in some cases their power in terms of influence is too low. Practice and facilitation: The researchers designed field experiments on deficit irrigation strategies in close collaboration with farmers to provide a learning space and to raise awareness of their farming environment and of the options for new water saving practices and techniques. These provide a technical object to deconstruct the current practices and to design a learning facilitation process that involves several stakeholders (scientists, extension agents, NGOs, local institutions and farmers coming from different part of the watershed –up, middle and downstream). The new learning spaces were understood as an opportunity to integrate traditional and scientific knowledge.